"As a music therapist I can give people back the power to communicate"
"I practised as a full-time music therapist for 20 years, mainly in the field of adult mental health as part of a large NHS mental health trust. It was during this period that I began to combine my clinical role with supporting the development of the profession. Along with another colleague, we developed a new MA course at Anglia Ruskin. This course became the first masters course in music therapy in the UK. I continued to work as a music therapist and today, we have our own new state of the art music therapy centre at Anglia Ruskin, where we not only train students, but also deliver clinical work with local children and adults, as well as lead a pioneering research department. I have always been passionate about the potential for music to change people, situations, and particularly to help communication when words are not available. I am a singer, pianist and violinist and using live music has been central to my work where music is used to work towards therapeutic change for adults with a variety of mental health problems including dementia, schizophrenia, depression and personality disorder. Latest studies show both that music affects the brain positively, and also that regular music therapy sessions reduce agitation and anxiety, and the need for medication for people with dementia. Leaving someone without the power to communicate is not right – music has the power to address that. Music therapy addresses the emotional, physical and intellectual needs of people with dementia and I have just begun talks with the local NHS trust where I work about referring more people with dementia for music therapy." “Play It Again, Sam”: How the Use of Music is Reawakening the Minds of Many Individuals Battling Dementia. 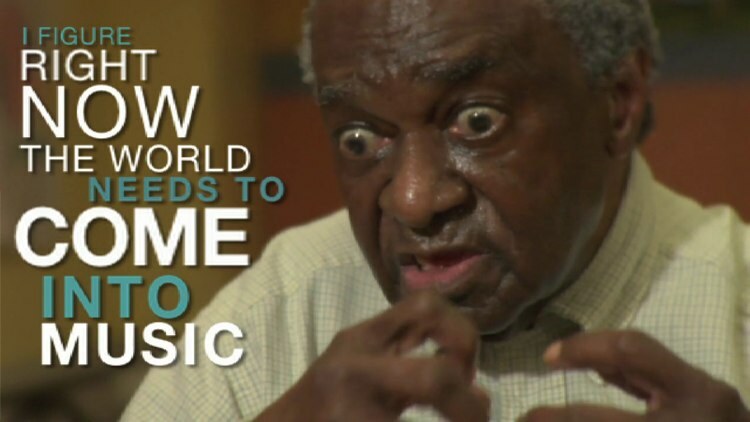 To say there has been a recent increase of videos on the web highlighting the power of music with individuals with dementia would be a vast understatement. From caregiver videos flooding YouTube to more carefully crafted films, such as Alive Inside, exploding on the scene, the individual stories being told are nothing short of remarkable. But what does this mean for us as speech and language pathologists? And what does research say about the overwhelming number of anecdotal stories being touted on the internet? The answer to both questions is, A LOT! Many resources, such as the nonprofit organization MUSIC & MEMORY, now offer an extensive list of research citations that highlight the clinical benefits that listening to music can have on cognition and communication. It’s not just researchers taking notice of the mounting evidence. As the Centers for Medicare & Medicaid Services makes a push to decrease inappropriate use of antipsychotic drugs in long-term care settings, some of its efforts go toward funding personalized music programs to help address agitation and other behavioral concerns in a non-pharmacological way. Many states are also embracing this approach with great clinical outcomes to report. So do we all switch professions and become music therapists? Of course not. The need for skilled speech therapists to directly target cognitive-linguistic deficits in long-term care settings is more important now than ever as the aging of our population and the dramatic rise in dementing illness converge, but the research and these dramatic personal stories should make us take pause and reconsider the environments in which we practice. As therapists we have a unique opportunity and perspective to be client advocates. What information can we share, what videos can we show and whose life can we touch to be a catalyst for change in our communities? Consider your impact and take action today. Still need convincing? Let me leave you with one final image. Watch as Naomi Feil, founder of Validation Therapy, makes a power connection with Ms. Gladys Wilson. I wonder how many speech therapy screen forms were sitting in her medical chart stating she was “non-communicative” when this was filmed. Today I had the opportunity to see The wild classical music ensemble performing at Cinquantenaire (Brussels, Belgium) on the occasion of the "Fête de la musique". So, I decided to present them to you. 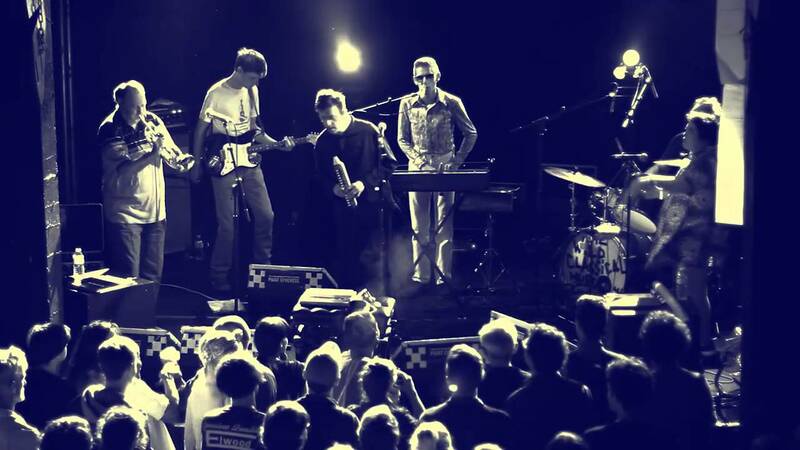 The band gave concerts in Belgium, the Netherlands, France, Spain, Germany and Switzerland and is willing to go further!! Their second album, "tapping is clapping" is released the 17th april 2015 on Born bad records, Humpty dympty, Aredje, Et mon cul c'est du tofa and Attila tralala. Each morning, Cali, an 18-month-old Rhodesian Ridgeback, patiently waits for the K-12 students to pass through the doors of the Calais School in Whippany, N.J. As they walk by, Cali sniffs each one. Cali is a cortisol detection dog, trained to detect the stress hormone our adrenal glands secrete when we become anxious or stressed. Many of the students at Calais are on the autism spectrum; some have attention deficit disorder, oppositional defiant disorder and other challenges that can trigger anxiety and other difficult emotions. Like most service dogs, Cali is extremely quiet and unassuming. “The students don’t like it when a dog jumps on them,” explained Ms. Butler, a health teacher who is a certified specialist in natural canine behavior rehabilitation and in animal adaptive therapy. A few weeks ago, in Ms. Butler’s office, Cali started pacing, alternately moving toward the door and nudging Ms. Butler. “She led me up one flight of stairs to the opposite end of the building, where we found a girl starting to have a meltdown,” she said. Noticing Cali, the student asked if she could pet her. Ms. Butler told her not yet. “I first make sure Cali is safe,” she said. “Within a few minutes of seeing Cali, the student calmed down.” Only then does she reward students by letting them pet, brush and — sometimes — walk Cali. At the end of the school day, the students board the buses back home, and Cali goes home with Ms. Butler. 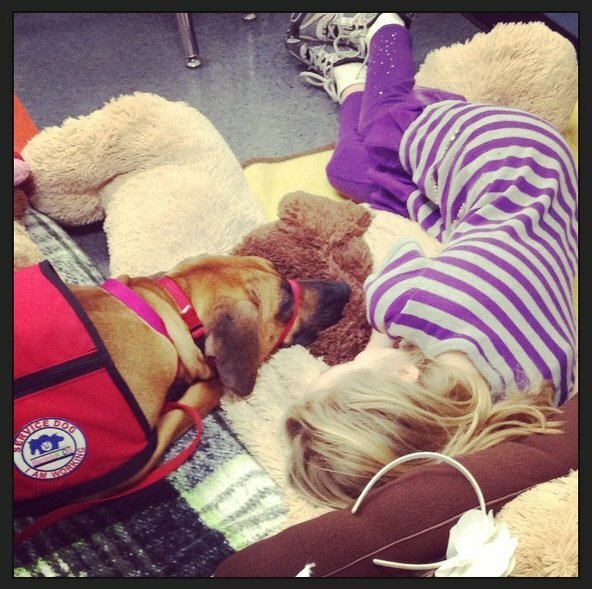 In a few weeks a second service dog will join the crew, a beagle named Cleo, an occupational and speech therapy dog. The students will work with Cleo to improve their fine motor skills by opening and closing the buttons and snaps on her harness, and will practice their oral and social skills by reading to her. Usada como terapia, a música é capaz de melhorar a concentração, alterar o estado de espírito e ajudar a combater algumas doenças. O Daily Mail reuniu alguns dos mais recentes estudos que comprovam o quão poderosa pode ser a música na saúde e na mente. Algumas melodias possuem efeitos mais notórios do que outros, mas a verdade é que a música é já usada como terapia no combate ou cura de determinadas doenças, especialmente psicológicas. Em 2008, escreve a publicação, o Centro Médico da Universidade de Maryland, nos Estados Unidos, concluiu que a música, principalmente a clássica, consegue ajudar na redução da pressão sanguínea. Músicas agradáveis conseguem deixar o sangue mais fluído em 26%, enquanto sons relaxantes apenas o fazem em 11%. Mas se há músicas com efeitos benéficos, existem compositores capazes de autênticos milagres. Conta o Daily Mail que um estudo sueco de 2005 revelou que os pacientes operados a uma hérnia que ouviram música durante a cirurgia tiveram menos dores no pós-operatório. Mas Bach e Louis Armstrong conseguem resultados ainda mais notórios: uma investigação de 2011 indica que estes dois grandes nomes da música ajudam a que sejam dados menores doses de anestesia em determinadas cirurgias, incluindo a de colocação de próteses na anca. Dois anos depois, um outro estudo relacionou a música com o combate à demência. Tese reforçada com uma investigação de 2013, que concluiu que os doentes com demência que ouviam música como forma de terapia tinham menos necessidade de tomar antidepressivos ou outro tipo de medicamentos. O coração e a música são também dois bons aliados, como indica um estudo que revela que algumas canções “melhoram a variação dos batimentos cardíacos” e reduzem os riscos de ataque cardíaco. Além disso, um estudo da Western University, no Canadá, indica que a música é capaz de acelerar a recuperação de AVCs. Há três anos, uma investigação publicada no Journal of Nursing Studies revela que as músicas relaxantes são a melhor forma de adormecer depressa e manter uma noite tranquila de sono. Mas não é só ouvir música que faz bem. Conta o Daily Mail que cantar pode ajudar a combater a asma, uma vez que permite melhorar a respiração e aprender quais os limites de cada pessoa.